Lesson: Share and Share Alike? Both European and Native American peoples left distinctive imprints on the land because each group used the same land in different ways. In this lesson, students explore some of the differences between these modes of land use by closely examining artwork that depicts homes and communities with surrounding landscapes from each culture, as well as essays that discuss cultural land use. What problems were caused when both the Pocumtucks and English settlers wanted to use the same land to live in the Deerfield area? 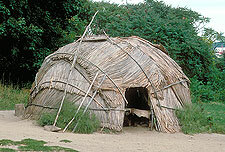 A modern replica of a wigwam. The Wells Thorn House in Deerfield, MA. Meet the Five Cultures - Wôbanaki - Click Learn More About the Wôbanaki and read the whole essay. Examine the first picture closely. Artifacts - click Structures/Architectural Elements, then Wigwam. Explanations - click Native Land Use and Settlements in the Northeastern Woodlands and read the following sections: Algonkian Homelands, English Deeds and Native Lands. 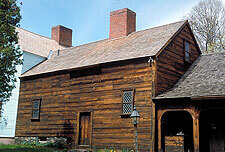 Familiarize yourself with English housing by going to the American Centuries website (www.americancenturies.mass.edu) to access the curriculum titled: Everyday Life in a New England Town - Lesson #4, The Homes, Possessions, and Way of Life of the Puritans at the First Turn (1680-1720). Click Part 6: The Wells-Thorn House, then click the first photo of the Wells-Thorn House, Outside, down on the right side under the Materials in Context section. Familiarize yourself with English land use on the 1704 website by going to the Explanations Menu, then clicking European Land Use and the Transformation of the Northeast. Read from the beginning of the essay to the section titled French Acquisition of Lands. Also, read the following sections: English Acquisition of Lands, Native Deeds, Establishing Towns, and English Use of Lands. Familiarize yourself with the Deerfield area in 1550 and 1700 by going to the Maps Menu on the 1704 website, and clicking the last link, The Deerfield/Pocumtuck Area. Examine the first illustration of Pocumtuck, circa 1550, and read the text. Now examine the second illustration and read the text, Deerfield, circa 1700. On the 1704 site, go to the Artifacts Menu and click Historic Documents. Click Chauk Deed and read the text accompanying the deed. You can read a typed version of the deed by clicking Text Transcription or by clicking Interactive Feature. If students are using computers in class, instruct them to complete the Student Activity Sheet for this lesson. If they will be using computers elsewhere, either give them the Student Activity Sheet URL (http://1704.deerfield.history.museum/teachers/lesson8_student.jsp), or print the Student Activity Sheet and distribute copies to students.